It's time for Wow again. I can't believe that next week will be #50! Thank you for making this party successful. It wouldn't be without YOU! So many great links last week. Here are just a few. Debbie of Refresh Restyle did a fabulous job transforming this table. I love the black stain and the shape. Fabulous lamp makeover by Rhonda at Blue Creek Home. She saved a ton of money doing this herself. For those of you who sew, not me, you will love this idea. Check it out at Craptastic. used to create the words. 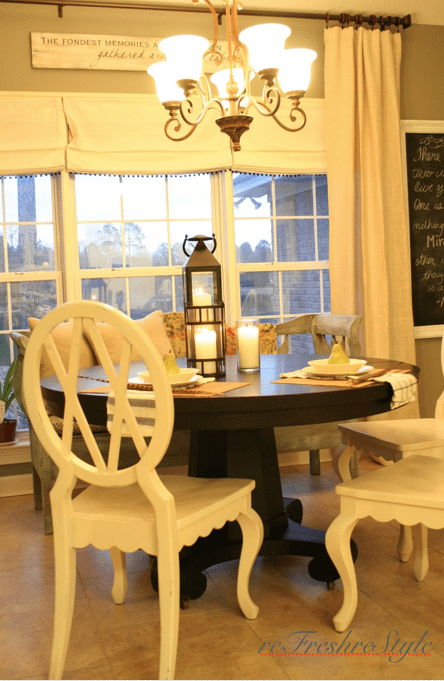 The Hopeless Romantic shares her gorgeous dining area. Sorry to entice you dieters with this image, but my oh my this looks good. Check it out at Cupcakes For Party. If that chocolate dessert wasn't enough for you here is another one. I have had this before and it is wonderful. Recipe can be found here. 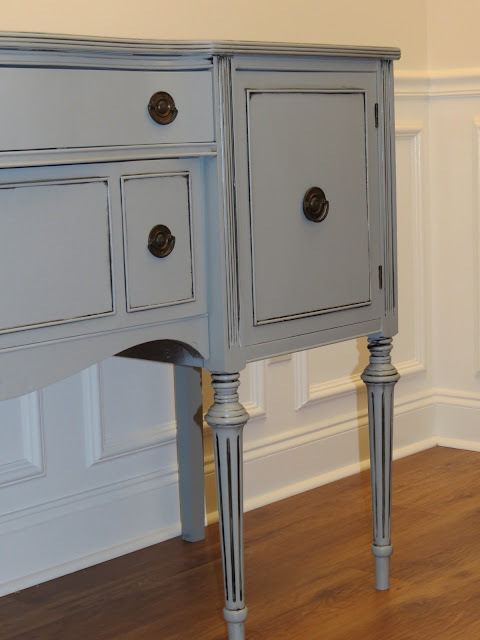 The soft grey color of this buffet grabbed my attention. This was shared by Chrissie's Collections. This is such a cute high chair transformation by Felicia at Skitt A Skatt. If you were featured please grab a "featured" button from my sidebar. Now let's see what you have to share this week. Please don't link the same post you did the week before. Great features, Kim. Thanks for hosting another great Wow Wednesday! 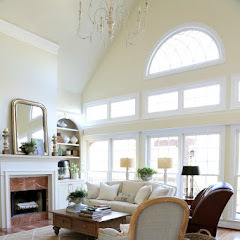 I love the new paint and touches in your sunroom! Thanks for hosting Kim. Wonderful features this week! Thanks so much forth feature Kim! Gorgeous features Kim, thanks for hosting! Hey Kim! 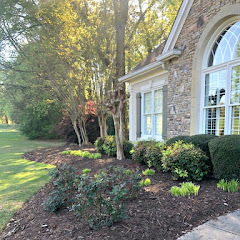 Love the projects you featured this week! Thank you for hosting! 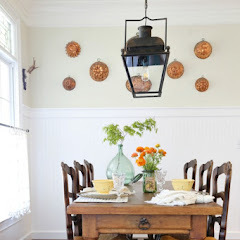 Love that chalkboard wall in the dining room! 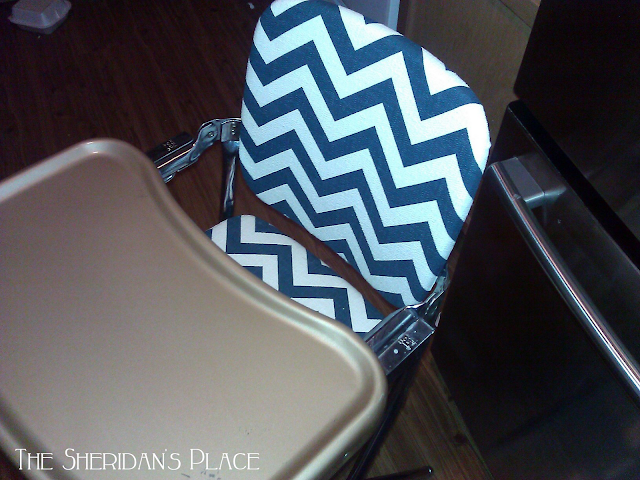 And the chevron desk - so cute! Great features Kim. Oh my the Cupcake looks so cute and delicious! Thanks for hosting. How I wish I had thought to cover Abby's ugly high chair with cute fabric! Funny, because I cover anything that will stand still now. :) Thanks for hosting Kim! 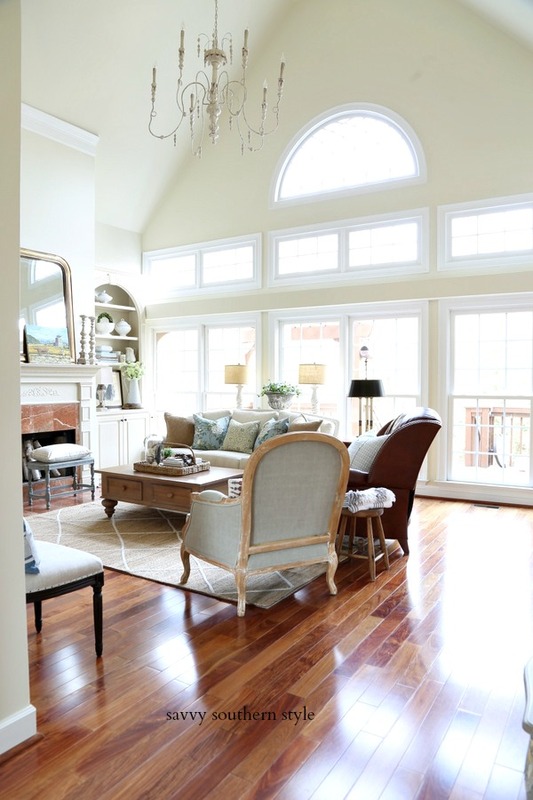 LOVE your pretty sunroom, I am so envious of that wonderful space. Thanks for hosting, Kim. Great features. Thank you so much for the feature Kim! I love all your picks! Congratulations on this fabulous party!! It is wonderful and I'm so happy for the people that you featured!!! Thanks for hosting, Kim! Such great features from last week! 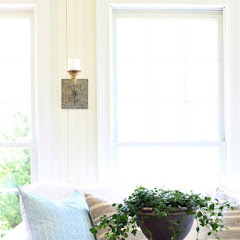 The changes to your sunroom are all fabulous, Kim! Great features! Thanks for being a terrific hostess! Great features Kim! Thanks for hosting I can't believe your at 50 WUW already! Time sure flies! oh my gosh, that chocolate is just not fair! great features, Kim, just linked up! Thanks for hosting Kim! Great features. Kim, thank you so much for featuring my black table! I was so surprised and Happy!! Thanks for hosting! Oh my ... gotta try those Hot Chocolate Cupcakes. YUM! Thanks for hosting, Kim. Oh my, so many great features and I see a ton of links already that I want to check out! :-) Thanks for hosting us Kim! Thanks for hosting again, Kim! I've linked up and can't wait to visit some neat things I've seen here! Thanks for hosting, love what I see! Yummy looking links! Thanks so much Kim! Great picks Kim. I make that chocolate dessert all the time. It is a family favorite. It is also super delicious with lemon in the summer instead of chocolate. Have a great week! great posts Kim thanks for hosting. You host an awesome party!! Thanks for hosting. I already visited a couple of your features. The grey buffet is beautiful. Your party gets such great links. Wowza- the talent here is fantastic! I always feel so inspired! Love your Wow Wednesdays. So much fun to look at. Love the features...those cupcakes! Oh my! Thanks for hosting Kim! Thank you so much, Kim, for hosting this great party! Such fantastic features!! All linked up- thanks for hosting!! 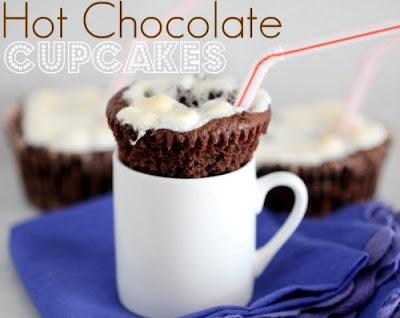 Love the look of that dining room and yum...those hot chocolate cupcakes! Happy to be joining this week with all these wonderful links. Thanks for once again hosting a great party. Thank you for hosting, Kim. Great features. Look forward to this every Wednesday!. Thank you so much for hosting! Great features! Loved them all. So many talented people. The blog posts are all so interesting this week, Kim. Thanks for hosting this party. It makes it so convenient for us to all read a bunch at one time. So many fun links all in one spot! Wow. I am off to check out the etched bottles among others! Awesome features Kim. Thanks for hosting, I am all linked up and ready to party. Thanks for hosting Kim! Always many great ideas here! Hopeless Romantics dining room is stunning! What wonderful WOW's. Thanks for hosting each week Kim! Great party! I have been jumping all around...though my computer will not open some of them, I don't know what the deal is. I have been having this problem for a week or more! Aggravating! WOW Kim.... Those are SERIOUSLY some GREAT features... :) thank you so much for hosting I just linked up "Going Fishing" Have a GREAT week!! Thank you so much for featuring me! I was so pleasantly surprised to see it! 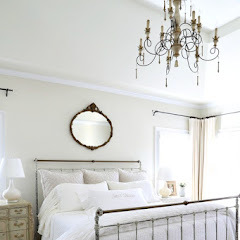 I linked up again, and I love all the links! I get so many great inspirational ideas here! Thanks so much for hosting, Kim. Have a great week! These are all gorgeous. Such talented ladies link up here! Thanks so much Kim. Beautiful eye candy. 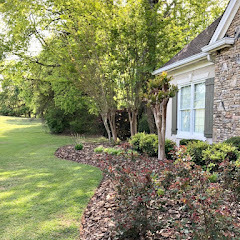 Just discovered your beautiful blog and I joined in the party! Thanks for having me! Fun and fab features, Kim !! Thanks so much for hosting !! Always inspiring, Kim. I love the chalkboard wall. How cool! Thanks for hosting this fun party. Visited several of the other links, enjoyed them, just to make sure my post would fit in and it seemed to. Thanks for hosting, always enjoy visiting your blog. That buffet makes me squeal. I've been stalking Craigslist for months looking for one to redo. One day my buffet will come....and you know I'll link it up here!! Fun party, lots of great inspiration! Thanks for hosting. Great party Kim, really great features. Thanks for hosting Kim, loved the features this week!